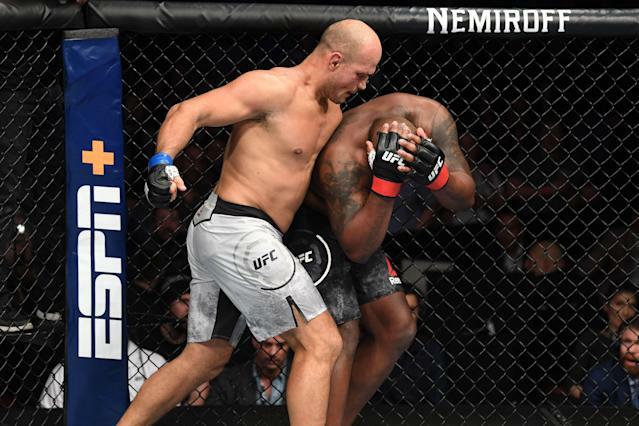 For a brief time during the first round of his second-round knockout victory over Derrick Lewis on Saturday in Wichita, Junior Dos Santos was doing his best impersonation of Jon Jones. Dos Santos finished Lewis with a big right hand at 1:58 of the second, but it was a spinning back kick to the midsection in the first that looked a lot like what the UFC’s light heavyweight champion has done so frequently which started Lewis’ downfall. The Brazilian former heavyweight champion caught Lewis squarely in the midsection, and Lewis was badly hurt and barely able to survive the round. Lewis never fully recovered and was no match for Dos Santos in the second. The win was Dos Santos’ third in a row and fourth in his last five outings, and put him squarely back in the heavyweight title picture. “How can this guy be in front of me in the rankings?” a mystified Dos Santos asked in the cage after the finish. Lewis, who was submitted by heavyweight champion Daniel Cormier in his last bout in November, entered the fight third in the rankings. Dos Santos was eighth. He looked, though, like vintage Dos Santos circa 2011, firing clean, crisp shots at Lewis and moving easily around the cage. Lewis caught him with one shot in the first that seemed to wobble him, but otherwise, it was all JDS. Prior to his recent hot streak when he’s gone 4-1 and only lost in a title bout to then-champion Stipe Miocic, Dos Santos was just 3-3 in his previous six and was taking big shots. He tightened his boxing and the results were evident. The toughest thing he had to do on Saturday was sing happy birthday to his young son, Bento. Dos Santos said he doesn’t care who he fights next. He said his goal is simply to remain active. “I want fights, UFC!” he shouted in jubilation.